J.M. 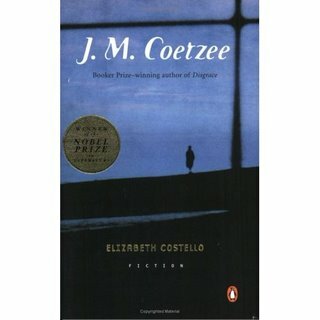 Coetzee is not an easy or fun writer, and Elizabeth Costello is not an easy or fun book. Although it says clearly in white letters on the cover that it is fiction, it is not really a novel, but a series of lectures or essays around the themes of animal rights, evil, writing, confinement, humanity, religion, art, and the proper exercise of power. Clever thoughts and neat, spare turns of phrase abound. On the surface, it is about us following Elizabeth Costello, a writer, through a number of engagements such as delivering lectures, accepting prizes, visiting her sister at a hospital in Africa. All of these engagements bring out a different set of beliefs and trigger a different lecture, a different essay on one of the topics Coetzee has prepared earlier. Elizabeth Costello is in some of these positions - she is herded like an animal, argued with, misunderstood. Her personal space is invaded. She is struck, she reveals herself, she writes, she eats or does not eat, she tries to get into heaven, she goes to Antarctica. You, the reader, get to make of it what you will. The blankness of Coetzee's writing lets you make up your own mind about her, and whether she is mouthing his words or not. It's all very clever. But of course, because I am the kind of person who does not normally read challenging fiction, fiction made of clever thoughts, I am suspicious of this book. Is Coetzee really clever? Or rather, are the ideas he discusses here really clever, or are they really basic philosophical questions that are so simplistic they can be inserted into a loose narrative and be packaged as fiction, even though they're not? Was this an experiment to make me, a reader of fiction (and a reader of Booker Prize winners, at that, and therefore a reader of quality fiction, not any old tat) think that I am clever? Is it a mindless book dressed up as something more, like the ape from Kafka's story, which Coetzee discusses? Or is it really the well-thought out quality it appears to be at first reading? It's hot. I'm tired, and I may or may not be rambling. I had no idea he'd done this. I have read some Coetzee, I found him through dad who loves South African writing, and I have always found him very dry. But I like dry of course, the only person in the modern world apart from Colm Toibin who likes The Master. He is very clever though. Particularly about South African politics of land and water and the impact of the end of apartheid on the white people in that country.